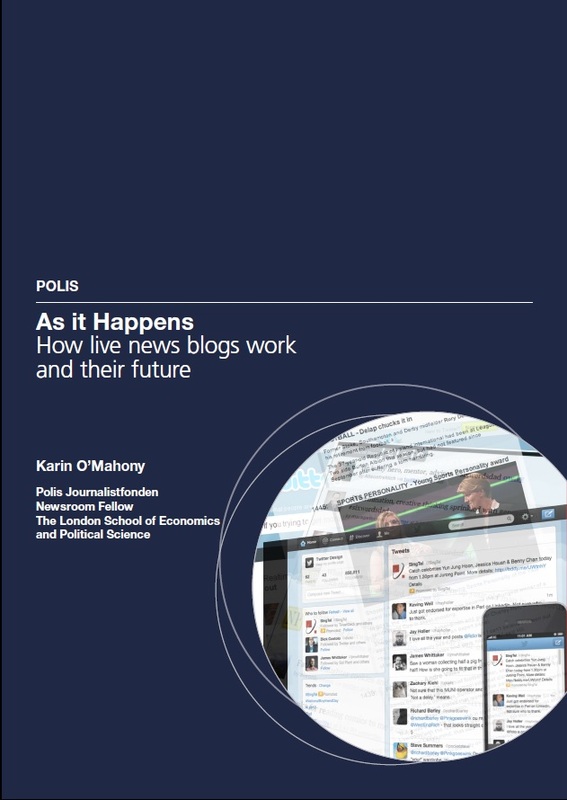 Polis is pleased to launch the report As it Happens: How live news blogs work and their future by Journalistfonden Fellow Karin O’Mahony. The report is available to download here. All the talk is of a crisis in the news media, but we sometimes forget that digital technologies can give us better journalism, too. A great example of this is live blogging. Everything from football matches to parliamentary debates are now routinely covered by a range of live blogs. In a 2010 Polis report on networked journalism we hailed it as ‘the new front page’ and for some readers this is now the most visible part of their online newspaper. It is the bit where traditional journalism is transformed into a mixture of broadcasting and instant storytelling. It is a narrative form that can combine tweets, audio clips, photos, video and graphics. It can draw material from social media or direct sources. It can cite learned academics, rival reporters or citizen’s emails. It’s fast moving, interactive and very accessible. Yet it is not easy to do well. How to verify facts in the heat of the battle? How do you paint a balanced picture of an event that is still unfolding? 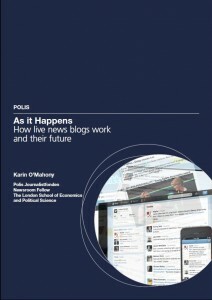 This report by a working online journalist asks whether live blogs are good for journalism. It looks in particular at two newspapers who have pioneered the format in two countries. It looks at a couple of contentious news stories in more detail. It sets out the key opportunities and challenges facing anyone who is live blogging and suggests that this format is going to develop in the future. Live blogging takes a combination of old and new skills. It uses different resources and it poses fresh ethical and editorial challenges. But I would argue that it gives more depth and breadth to instant journalism. Journalists are better for doing it and the reader likes them. Live blogging is just one of many inspiring new formats for online journalism, but it will remain central to the offering of any news brand that wants to be fast, alive but also adding value. We hope this report will help anyone involved in live blogging. We think it will help newsrooms shape their tactics or strategy for live blogging. We welcome any thoughts you have on this or associated issues. We are grateful to Journalistfonden for funding this annual Newsroom Fellowship at LSE and we welcome other proposals to support similar research. I am also grateful to the interns who helped on this project and all the academics and journalists who gave their time to be part of the research.